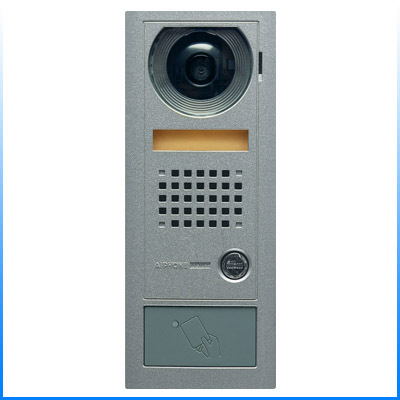 Video Door Station W/HID Reader - The AX-DV-P is a vandal resistant, surface mount door station used with the AX open voice, color video entry series. The unit has an embedded HID card reader with a standard Wiegand output to an access control panel. The AX-DV-P is wired using CAT-5e cable to ease installation. The unit mounts directly to wall surface. The AX-DV-P faceplate is cast aluminum, the camera is protected with a clear Lexan lens cover. The AX-DV-P features a color CCD camera, speaker and mic for communication, illuminated call directory and white illumination LED for low light conditions.